The Santa Fe Center for Transformational School Leadership grew from a series of conversations with colleagues about the importance of supporting leaders who are trying to approach schooling in a more humane, creative, learning-focused way than is generally acceptable in today’s political climate. We came to the conclusion that thinking differently about schooling is extraordinarily difficult in the midst of leading a school. It is somewhat akin to Hemingway not being able to write about Paris while he was in Paris. Leaders need space and support to build their own transformational capacities, to try on different ideas, to explore their own learning experiences, and to clarify their visions of school. 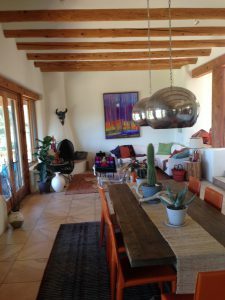 In keeping with that idea, we purchased a beautiful home on Atalaya Mountain overlooking Santa Fe, but only five minutes from Canyon Road, the mile-long street filled with amazing restaurants and art galleries. The house is located in the midst of the forest and has two lovely guest rooms with private baths and mountain views. It provides a marvelous place to rest, recuperate, to think deeply, and to reconnect with what is important. Terrific hiking is just steps from our front door. Additional rooms are available at nearby St. John’s College and the many wonderful Santa Fe hotels and bed-and-breakfasts. The house is also the Center’s Office, and provides a place for meetings, planning sessions, and professional development. We can currently host all-day sessions for twelve people comfortably but larger spaces are easily procured at the nearby St. Mary’s Retreat Center. We believe that great leadership is an art form, one of the most creative of professions. Because Santa Fe is considered second only to New York in terms of art markets, we find it easy to integrate the arts into our work. Participants in our retreats or workshops may find themselves attending the world famous Santa Fe opera, or a concert by the Desert Chorale, or hearing from a local artist about where he finds inspiration for his painting or sculpture. And don’t be surprised if you try your own hand at watercolor painting or sketching or poetry writing. Many of our team members are skilled artists themselves and find ways to incorporate their art into their sessions. The Center’s Team is currently growing, and consists of outstanding professionals from around the country who are aligned with our mission to help leaders transform their schools into rich learning communities where both adults and students learn in authentic ways, often in a context of social change. Our team is available to provide professional development or consultative services in your schools or in the environs of Santa Fe, whichever works best. We are also able to access training sites in Boulder and St. Louis, if these locations better meet your needs.